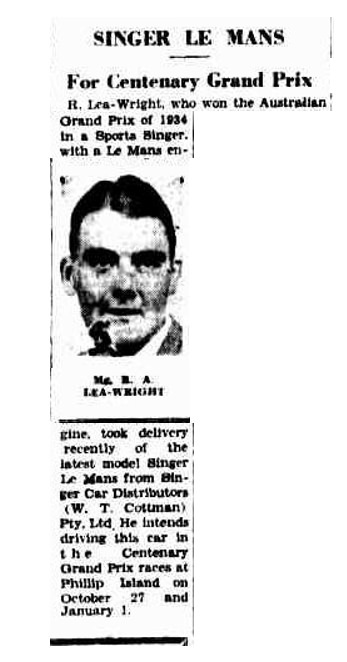 I am very interested to know more about Mr Wright and the prewar Singer cars he used. 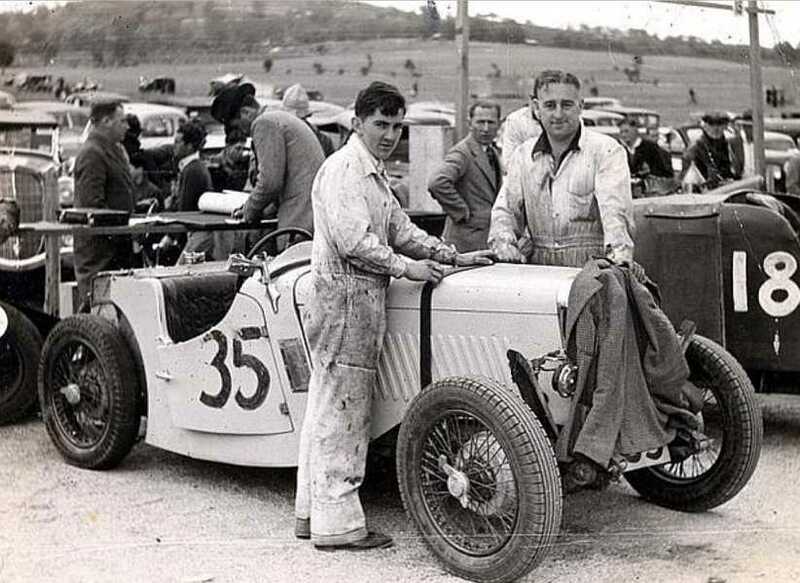 I have found a small article on the internet about his mechanic who rode with him during the 1934 Australian GP and one small pic of the 'stripped' Singer Le Mans, that I have seen mentioned here and there, but that is it so far. I have also seen that he had a Singer Le Mans special with a larger engine fitted, but I haven't been able to find out anymore than that. If you have any information about the cars and/or pictures I would be very grateful if you could share them with me. you see, by the way the title for this thread was worded, I thought it was about some sort of singing group! And if it had been titled "Bob Lea-Wright and his Terraplanes," what would you have thought then? Bob Lea-Wright, from what I recall reading, was a big man, so any Singer he had under him had a job on its hands. An interesting character, born of British parents in Shanghai, he was 6'5" tall and was a pilot in the Royal Flying Corps in WW1. After the war he participated in swimming competition and won the 1922 200 and 400 yards Australian Freestyle Championships. He was also a boxer, his size must have made him a formidable opponent! His first entry in the Australian Grand Prix was in the 1929 event. His entry was listed as being a Singer of 848cc, but this failed to make it to the event. This car, owned by Overseas Motors, caught fire en route and was apparently too badly damaged to continue. 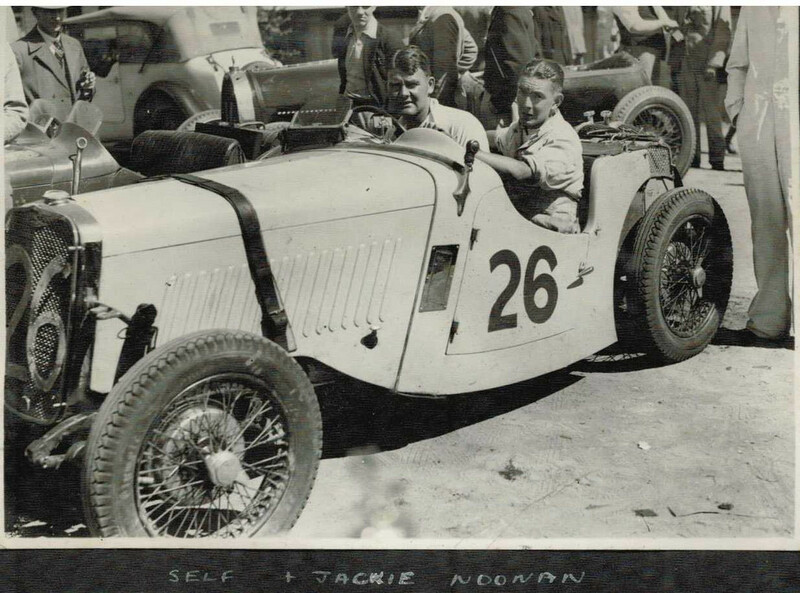 The next entry of a Singer in the AGP was that of Jack Sidebottom in the 1931 event, this car was listed as being 1792cc and a 6-cylinder. Its entry was repeated in 1932, then in 1933 there were no Singers entered. 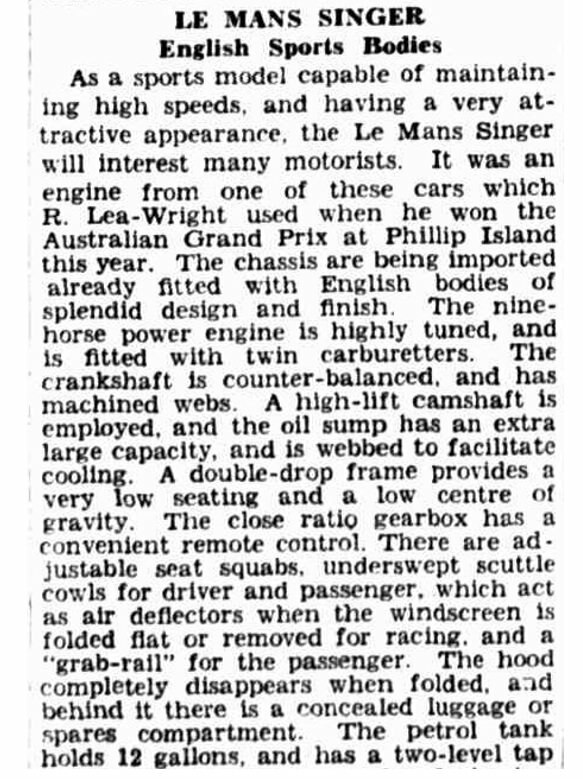 The return of Bob Lea-Wright to the entry list in 1934 was one of note, for even though his engine tossed a rod in practice it returned for the race and won by 14 seconds. The capacity was listed as being 1972cc. The following year was the same, a Singer Le Mans 9 with a 1972cc engine. Sidebottom was back with his 1792cc car. Could the historians have mixed up those engine capacities? That was the final entry of Lea-Wright in a Singer, he switched to a Terraplane Special when the race moved to Port Elliot in 1936 and the entry was opened to cars of over 2-litres. 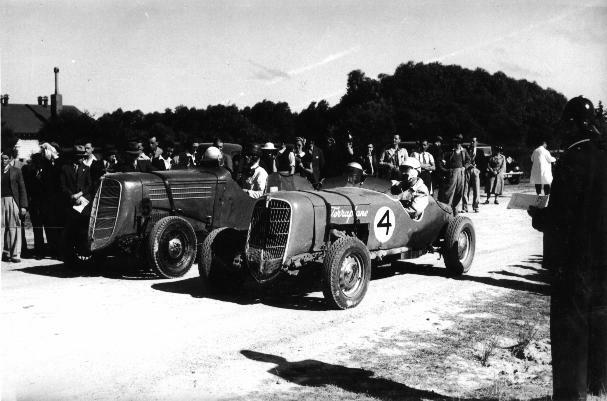 Singers returned to the entry list in 1938 when two 'stripped Le Mans' models were entered, one of them for John Pike. There's a photo of this car sitting alongside of Lea-Wright's Terraplane in the pits in the AGP book. It looks remarkably similar to Lea-Wright's car as it ran in 1935 and the engine capacity is down at 972cc. Could it be that the larger capacity recorded for 1934 and 1935 is in error? Does anyone have any information to correct this if it so? Thank you Ray for all that info. I have found these larger capacity engines interesting as Singer did have 6 cylinder engines in the capacity of 1792cc side valve and 2 litre(or thereabouts) OHV in that period. Did these chaps indeed use these engines or are they period typo's??? I have seen pics of a six in a Le Mans chassis so they do fit. It's entered as such on two separate years. I have just stumbled upon a result sheet for the 1931 AGP. Jack Sidebottom didn't finish(?) but he was running in "class D" which was the big capacity class. The various mentions of the car being 1800cc and the fact that Singer had a 1792cc engine can't all be mistakes. So....if Jack Sidebottom did that then it could be that Bob Lea Wright was running the 1972cc six pot engine in his Le Mans. It kind of ties in as I think the bigger unit came into existence when Wright made his return to the AGP. To win against MG K3's I think that a severe power hike was required and the small 4 pot was swapped out. Much easier to do than re-engineer the Singer 972cc engine for a supercharger. for example. If it is indeed true that the six cylinder engines were used in the 972cc Le Mans chassis I wonder if they went all out and had them on triple carbs??? Don't forget, the 1934 AGP was a handicap. The Singer was nowhere on scratch. 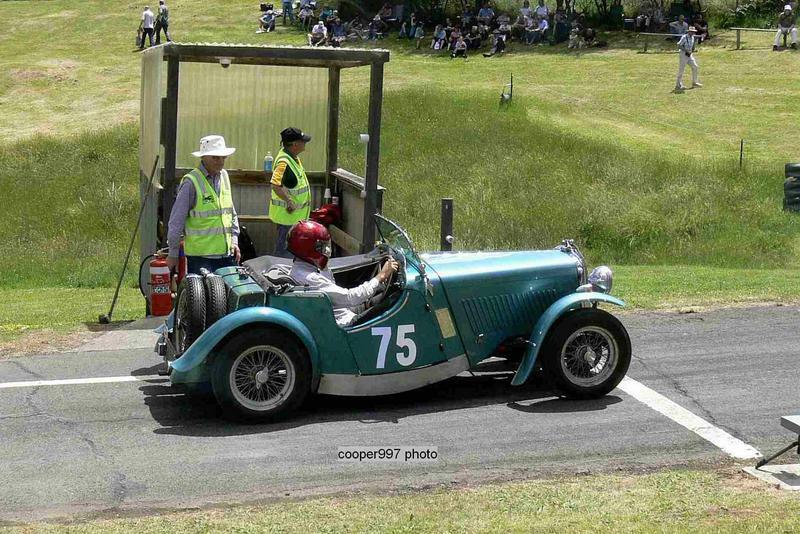 Thompson's MG K3 made fastest time from Jennings (MG Magna), Terdich (Bugatti), Dentry (Riley Nine) and Warren (MG J2). Ahhh.....thank you for that info David. Hence it's easy to see that it's simply an error. You don't want to know about Jim Bertram's Singer, do you? How did you know that, Ray? Ray - to be honest I would like to know as much as possible about any, or all of the prewar Singers that were in Australia. Maybe this thread should be re-titled to Australian Prewar Singers as I am starting to realise that there were a great many used in Australian racing. How did I know what, Greg? I've just acquired a Singer 9 Sports to accompany our other '34 Le Mans racer.....so am chasing whatever leads I can! Would love to hear any updates if anyone has any! Of some interest might be that every other car, of those which completed more than just a few laps, lapped faster than Lea-Wright. Lea-Wright was extremely consistent, however, and had a 35-minute handicap in his advantage. The other two cars on the same handicap quickly drove away from him, but both of them (MG Midgets) were to strike trouble. On a circuit where long straights were the order of the day, I think that should seal the issue of engine size. That and the fact that the best handicap of a 2-litre car was 18 minutes. I've dug through a LOT of the Trove articles (somewhere north of 60 are saved on my computer!) but none mention the colour, or the capacity it seems! What I have found is that it is highly likely that it was actually a Singer 9 that he ran, NOT a Le Mans as has become folklore. The articles of the time state he was racing a Singer 9 with a borrowed Le Mans engine from Arthur Beasley's car as they blew up the original motor in practice on the Saturday. Lea-Wright Motors also put an advert in one of the local Melbourne papers later in 1934 (June I think) to say that they had just received their first Le Mans model for Lea-Wright to race (which he then did in the LCCA Winter 100, and the 1935 GP) So the evidence does suggest that it wasn't ever a Le Mans - and potentially why no one has ever found the car! Even the 6-cylinder Le Mans of the later years didn't have the claimed 1792 or larger capacity that they wrongly listed on the entry form. I suspect it would definitely have been a 972cc. If only the LCCA/Vic records still existed! ARGH! It may have been a Le Mans motor, but the Blandon book is unclear about this point and it may well have been a standard Singer engine. Pointing to that is the fact that they went to a lot of trouble to run it in before the race. A further problem in looking for information on this is that Peter Dale's histories of the AGP races in AMS ends with 1933! Peter was there and would undoubtedly have had the facts. I have the articles from Trove saved on this machine - I just can't spot it at the moment! Stay tuned! And this - probably few people have seen! Appeared in a Sydney paper after the AGP. According to reports at the time, he drove the car to Sydney to put it on display at the Royal Sydney show the following weekend. Whether or not the car came back to Melbourne later on or not, I can't find any trace! His 1935 car I have a sneaking suspicion is currently in existance in Ballarat! A few things have lined up to suggest it, but it's near impossible to prove! I still have on offer information about Jim Bertram's Singers. But that's all post-war and ranges right up to today. What sort of information does it have Ray? I'd be very interested in seeing it! Nathan, have you swapped Singer tales with Louis Santin? He has the ex Murphy/Gray Singer-Holden. If not I can point you in his direction. I haven't spoken to him for 12 months or more - but with my new project, I probably should make contact again! I have a sneaking suspicion that his car may actually be Bob Lea-Wright's 1935AGP car too. We chatted about this last year and between us we have some corroborating evidence - but nothing concrete! I'm in Bendigo, and he is in Ballarat I think? But we're yet to bump into each other for a good chat! He might know something about John Pike's car, though. Jim was renowned for his ability to prepare race cars and used his abilities during those early years to enable his Singers to beat TCs on a regular basis. Nathan, if you can pin Louis down again for a chat I'm sure it will be beneficial to both. You'll just have to get him away from restoring other peoples cars for a moment. He had tracked Frank Murphy to the Euroa area, but unsure whether he has caught up. If Frank's up to it you might get some Singer recollections from the 1950s that could add a piece to the jigsaw.. Thanks again Stephen! I'll chase Louis etc up this week! Edited by ntasca, 12 November 2017 - 05:44. This June 1955 Rob Roy film has #49 Frank Murphy Singer Holden at about 2m 58. 62 years later, still at Rob Roy, here's Louis Santin running the same car - but Hillman powered. Edited by cooper997, 22 November 2017 - 06:30. The perils of the course can be seen here, though in the earlier days the braking areas and corners weren't oil-sealed as they are shown to be here. Edited by Ray Bell, 30 November 2017 - 04:26. I'm still working on proving that my car is in fact his '34 car.....and again, have found 3 or 4 circumstantial links.....just nothing concrete; yet! So news on the Lea-Wright car hunt has come to this! We also confirm that the GP car that was reported as an Le Mans - but it DEFINITELY wasn't - as it was a flat-chassised vehicle with a locally built body - essentially, everything from the back of the bonnet backwards was built here in Australia. For all intent, it must have been a Singer 9 Sports. So it seems the car was pretty active - right up until the point that it wasn't! After that, it vanished! Having gone through 3 motors (and maybe a 4th) I'm wondering whether it was getting to become too 'used' and not competitive enough to bother with? RLW moved onto Terraplanes and found them competitive! So maybe the small displacement Singer was just left out the back somewhere (Or given to Arthur Beasley?) and languished somewhere. Not sure yet! Great thread and research. Just what this forum is missing so much these days! Thanks Steve - the history of these cars is as important to me as anything else. I'm a history teacher by day, so I love it! I've had some amazing discussions based around these cars with a lot of experts (and some 'experts' too!) over the last few months! There is probably a book in the whole story somewhere, so it might turn into a website one day! I added this in the other thread, but thought it was worth a share in here too! It has been a while between posts - but there has been all sorts of progress! "The" car is now in this state, and has had a fairly solid amount of work completed in the last few weeks prior to it going on show at Motorclassica for next weekend! Dad deserves most of the credit and has put in HOURS. I've had to balance playing Dad with my two boys at home and getting work on the car which has been 1.5 hours away from where I live! I secretly think my wife deserves a medal too! There is LOTS more still to do to finish the car, it's not running, and not painted etc. But we'll continue plugging away! How old are the two boys? Are they old enough to be inducted into "helping" - polishing [spare] panels, sorting out nuts and bolts (a lovely mucky job) etc? Both are pretty keen on old cars though, so the brain-washing is well and truly underway! I'm a 'relative' youngster in the world of old cars - and from my perspective, there is a LOT of hard work that has to go into the hunt for the information! In a world where instant gratification is pretty easy to find, it's a tough gig to find people interested in the long game to chase leads and get the information! The other challenge is that a lot of the people that held the information are now no longer with us, so it's a little tougher to find the 'experts' in the area of interest (and some experts that are around don't like to share much either!) That being said, the number of people I chased up via this forum that have shared huge amounts of information with me has been absolutely invaluable! I think the challenge of getting the next generation of vintage car nuts invested and involved in the hobby is something that is facing MANY clubs around the world! It was both a serious and a facetious question -- or to be more accurate, a comment. Your reply does lay out some of the issues that affect the sort of research you and others are attempting, some more successful than others for many different reasons, of course. some of which, again, you mention. Expertise within the field of automotive history, and especially that involving motor sport, often tends to be pretty much as you suggest: those willing to share and those who don't, along with those no longer around whose materials tend to end up in dumpsters. I would also suggest that there are more than a few charlatans residing within the "expert" ranks, some known, others not, but that would be unkind. Fortunately, for whatever the reasons those willing to share their knowledge and information (they are definitely not the same thing) tend to outnumber the others. In my dotage, I suggest that we need far more historians interested in the field of sport motor and various niches than "car nuts." We have essentially skipped a generation, something now beginning to become more and more apparent. Some of us have been campaigning the recruitment of budding historians to turn their interests in the cultural turn of history to include automobiles in their studies, especially the role of motor sport. 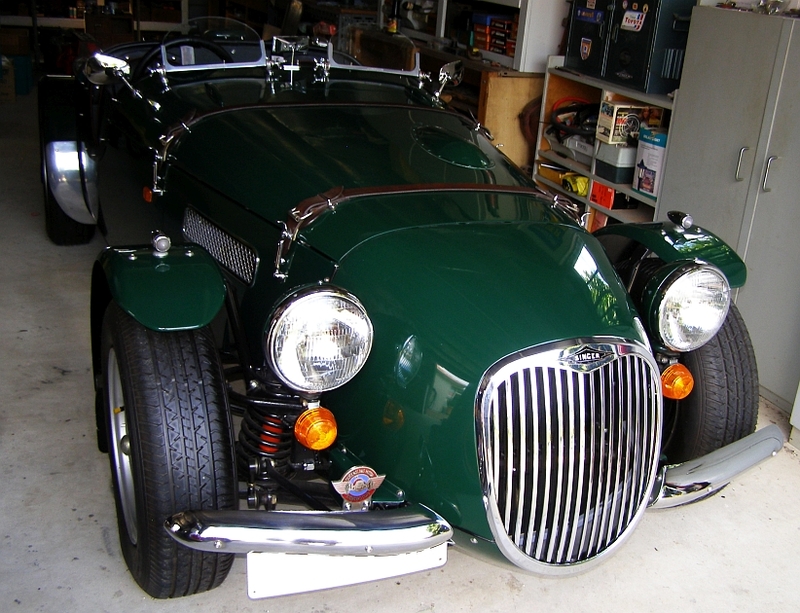 I no long have much interest in vintage cars per se, having dealt with some of the charlatans suggested above, but I am still very interested in what artifacts such as former racing machines can help us understand motor sport and its history. The collaboration of scholars is an essential aspect of research and interpreting the past. One of the goals I had for TNF many years ago was exactly the sort of work that you are doing at the moment. Thanks HDC! Part of my issues/concerns with the making much of my research public is that some of those 'experts' have been quick to knock down much of my research solely based on their 'expertise' that has then been taken as fact. It's one of the joys of being a newcomer I suppose! I have had much support from several local and international researchers whom I have much respect for though - and many of them have come directly from this forum. 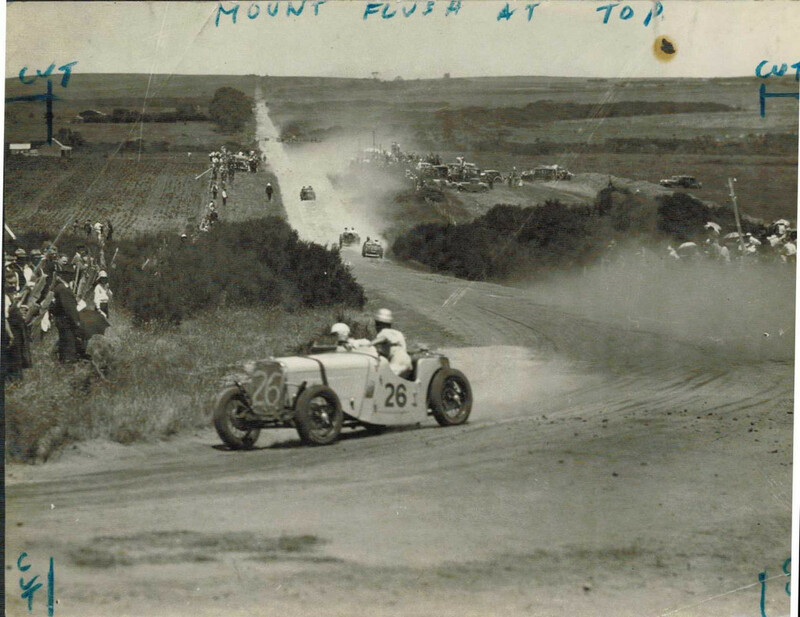 Ideally I'd like to spend more time and effort getting further into this field, of particular interest is racing in Australia up until the early-mid 1950's (before the 'exotic' machinery of Europe took over) so hopefully I'll be able to chase this in the coming years if I can start to make some contacts! People like Mark at Primotipo.com and others are doing a fantastic job - but I'm sure there is more to share! I just had a read through of the thread again, and realised I didn't share a lot of the story too! Part of my research on the history of the Singers that raced pre-war led me to making contact with Bob Lea-Wright's daughter (who is in her mid-60's). From this interaction, I managed to then receive his actual photo album with Bob's handwritten notes on many of the photos. I took digital copies of it all, then returned the album, and a digital copy to his daughter; along with a small plaque that would have been mounted on a trophy that Bob won in 1937 that was uncovered only 30 minutes from my home. She was very touched by finding something that her "Dear Old Dad" had won 80 years ago! The next step was debunking the fact the car wasn't a Le Mans (as mentioned above) that was then ratified by several marque experts who have done a power of work on the same topic in their own right and whose opinions I value, as do many. I've written several articles for the Singer Club newsletter over the last 12 months documenting this - and probably have another one or two left in this car from the research I've managed to accumulate. I felt it wasn't really my information, but information that belonged to the club! Lastly, I managed to uncover the fact that the 1934 AGP was filmed for a short newsreel of the day. I knew it existed, then eventually found that the National Film and Sound Archive held a copy, but a company in the USA owned the rights to it, but didn't have an actual copy of the newsreel! So; using Bob's daughter as the family connection, doing the application and waiting for about 5-6 months for the process to unfold, we uncovered this video. Bob's daughter apparently watches it over and over as it shows her Dad in his prime, talking on film! I don't know where we stand with the rights to this; so it is an unlisted video on Youtube currently! And I've not (yet) shared it via my Facebook page (as listed in my signature) but please watch and enjoy! Also, if possible, what year? I believe it is at the Island. Yes, I'd be pretty confident that it is indeed Lea-Wright in the car on the left. I think the one of the right is Harry Beith as well? There was a 3rd person running a Terraplane at the time too (I can't remember the name!) so it could be that car! Lea-Wright ran at least 3 different iterations of Terraplanes from '35-39, so I'll see what I can find tonight for you! I do have some more photos - but they are on a hard drive on my kitchen table currently (And I'm currently teaching my Year 11 History class!) So I'll try and get them tonight and dig them up for you! Les Burrows was also running a Terraplane at that time, and George Bonser. Edited by Ray Bell, 09 October 2018 - 07:45. Sorry, have been under the pump getting the Singer finished off and ready for display at the 90th Anniversary Display at Motorclassica which is on this weekend! Hectic is somewhat of an understatement! I pulled out a couple of photos from the the Lea-Wright album that might be of interest. 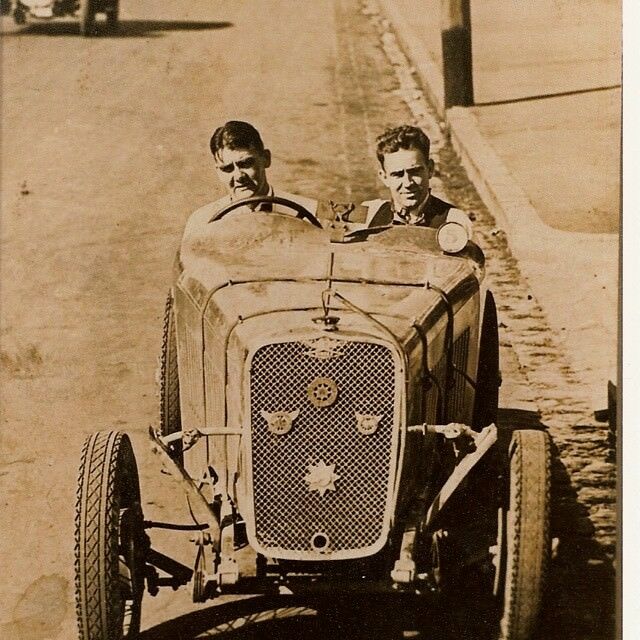 It shows the Beith Terraplane in the first one; shot at the SA GP at Lobethal I think? The second is of what I think is probably the 2nd version of the Terraplane Special that Lea-Wright used. Again in SA. This car must have been sold to one of the other Terraplane users at the time. I'm not sure who; my knowledge of Terraplanes in this period is pretty limited. He definitely ran a 3rd car though at Bathurst in 1938 that was destroyed by one of his mechanics who shot it down a cliff when driving it home after the event. As far as I know, know of the Terraplanes are currently accounted for though! He definitely ran a Terraplane at Phillip Island (the 2nd, smaller triangular course). I had the plaque from the trophy to prove it for a week or two; it was found about 50km from my house; but I reunited it with the Lea-Wright family rather than keeping it! It was for the Phillip Island 150-Mile Trophy in 1937 I believe. So I suspect that is when your photo was taken! I strongly suspect the car featured below is the one that is hidden by Beith's car too Ray All taken in SA; but I'm not sure if at Victor Harbour or Lobethal - but I suspect Lobethal? I'm sure the gang in here will be far better at knowing that than I am though! If those pics aren't showing (they are fine on my end! ), please let me know and I'll re-jig them via another hosting platform again! They’re fine (and fascinating), Nathan. All 1938 Lobethal, most easily identifiable by car number , and sandbags not fencing down the Lobethal esses. .. and those Very Bad Hats, used by other contemporaries like Jack Phillips back then.